This is it. 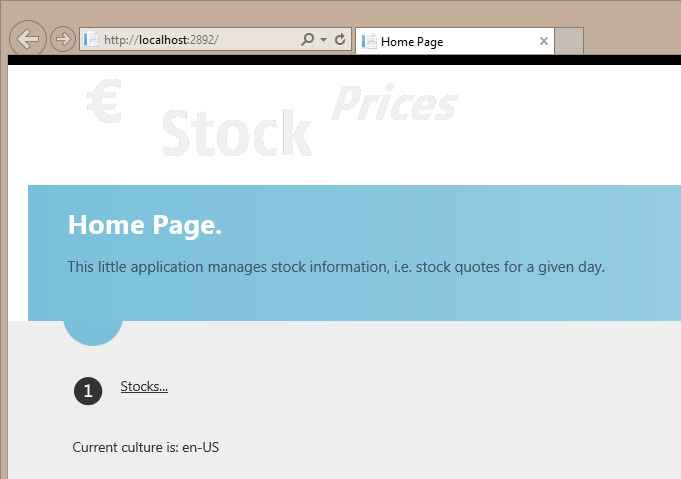 The complete overview of localizing a regular MVC based web application. This is the one thing regarding localization I avoided. The reason is simple: I don‘t know enough about this topic. Technically there is the dir attribute in HTML and a respective direction property in CSS. But beyond that I would also want to know how RTL affects the screen layout, tab order, etc..
Not much to say. WebAPI controllers participate in the scheme we have set up, so the controller is aware what culture the user prefers. The data serialization itself ignores the culture, thus data exchange at the raw level (JSON) is not even affected. Apart from a few hints regarding client side validation (which is specifically supported by MVC via unobtrusive validation), everything I presented basically happened on the server. So, if you build your application using Knockout, Angular, Sencha, or other frameworks – which generate large chunks of the UI employing databinding strategies – you will need to localize on the client as well. The server may still provide the necessary backing in terms of logic and translations e.g. as JSON service. Taking „client side“ one step further and building container applications based on PhoneGrap/Cordova, you will have to provide everything on the client; you just cannot afford to not render the UI just because the device has no connection right now. Thus you’ll need to address localization completely on the client, functionality as well as information; no server backing in this case, sorry. For an application used internationally, it may not be sufficient to just localize the UI. You may have to localize your actual data. Formats, content, even business rules. Well, I’m going to leave these topics for someone else. And with that, I conclude this little series. You can find the sources of the sample I built for this series on github (VS2013 project, NuGet packages have to be restored using “Enable NuGet Package Restore”, IIS Express is expected). Localization quite regularly involves localizing additional 3rd party controls. This is something that your control has – obviously – to support. Fortunately many controls – certainly the commercial ones, such as Telerik do. Unfortunately (but not unexpectedly) each and every one has its own approach to localization. To get a better feeling for the demands, let’s take a look at the jQuery UI date picker – the canonical example for additional controls. We have all the information handy and did the same thing for globalize, right? Wrong actually. 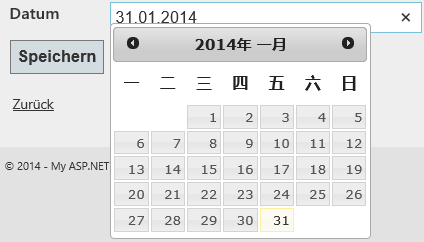 Date picker localizations generally exist for the neutral culture (e.g. de) and only those specific cultures that differ form the default one. E.g. there is a localized version for en-GB, but not en-US, or de-DE respectively, as en and de are sufficient. 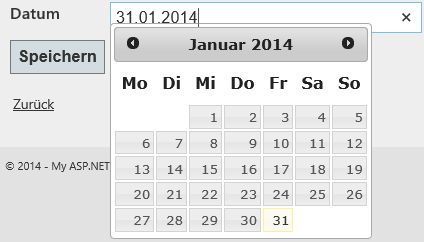 On top of that the date picker does not support a proper fallback strategy, i.e. setting the region to de-DE will end up using the last included region, again zh-TW if you included all regions, not de. This is an issue that is rarely mentioned and sometimes missed completely. 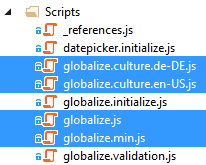 With Globalize you need to set a region explicitly, the date picker does it implicitly with referencing the localization file. Globalize supports a fallback to the neutral culture if the specific region is not available. 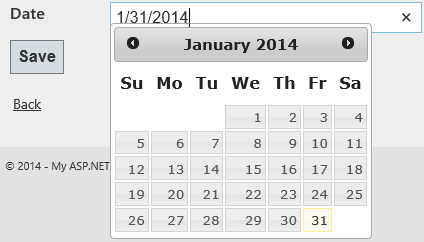 Date picker does nothing of the kind and simply ignores the call. And these are the subtle differences in two packages from the jQuery universe. That might be a good indicator as to what to expect with 3rd party libraries from another source. Bring together a couple of controls, and you’ll have a mighty mishmash. This is another topic that is widely documented for the most part, but has some notable gaps. Having the error message in localized German does not solve the fact that the date is actually in the valid local format in the first place. We should not even get an error. The generally cited answer to solve this issue is to use Globalize from github… which requires a little handiwork. … you need to grab the globalize.js file from github under lib\ as well as the necessary localizations under lib\cultures\. If you require compressed versions (globalize.min.js below), you’ll have to create them yourself, e.g using http://jscompress.com/, as they are not provided. All files are then placed in the /Scripts folder of your web project. Note: there is also a nuget package, which will install these files – including all localizations, but still no minified version. … we need to initialize the culture on the client side. Note: If you are using jQuery validation directly (not via unobtrusive validation), you’ll need to wire all methods in $.validator.methods respectively. 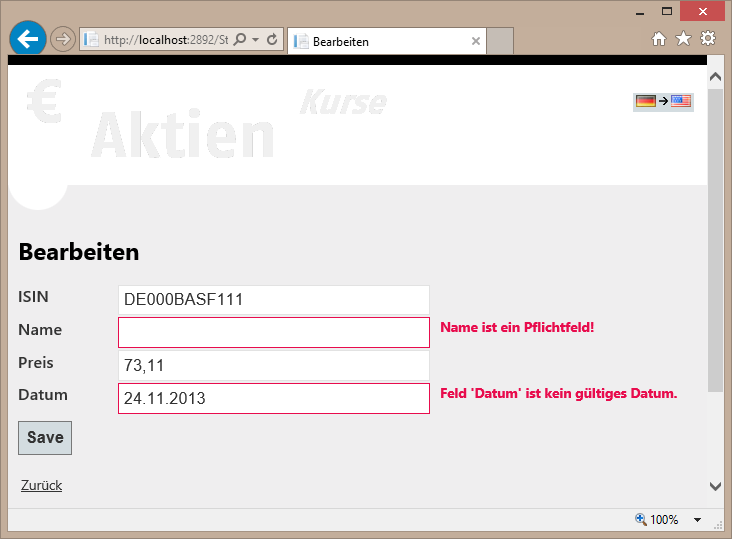 And now our validation code works just fine, properly recognizing German date and number formats. UPDATE: Just when I finished writing this post, I stumbled upon John‘s post, which is the first one I found that connects Globalize and jQuery validation both correctly and completely, and even provides a nuget package. The last post introduced resources and used them directly. When it comes to localizing views aspects based on data – i.e. 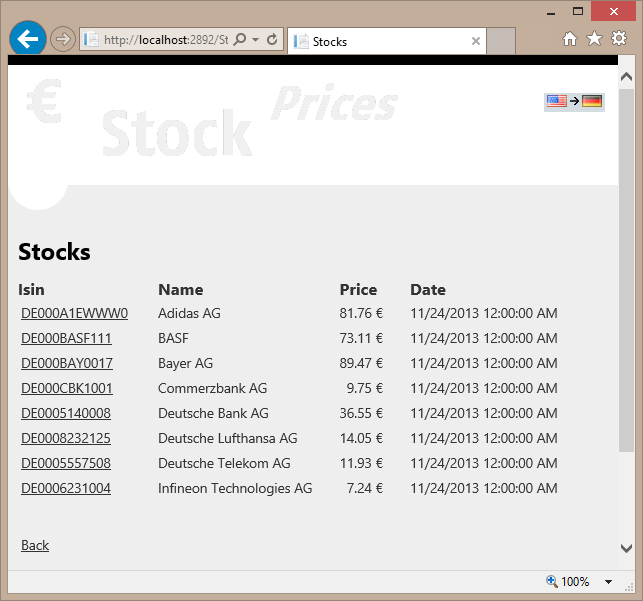 databinding against models – resources are also the means to localize the data aspects. Localizing the displayed data is something that is fairly broadly documented, therefore I can keep the basics to the minimum and focus on the stuff that is rarely mentioned. If you need more background, the ASP.NET site provides the perfect starting point. This post will concentrate on localizing the data related labels and validation messages; localizing the actual validation is going to be addressed in the next post. The M-part in MVC is the model, in ASP.NET MVC usually consisting of POCOs. Data validation as well as localizing labels in MVC is based on attributes put on the data model. The very first question – and usually one that is not addressed – is one more related to architecture than to plain code: Which class shall I attribute? You might already see the respective validation messages properly translated. This depends on the language version of the installed .NET Framework. Generally I would be careful to rely on the fact that all necessary languages are installed in production. Latest when custom feedback is required you need to provide the message in any case. That much can be found in any tutorial. What is also rarely mentioned though (much less documented), is that these localized messages can use string.Format placeholders. Let’s state that clearly: You do not have to provide „field XY is required“ messages for each and every field! (as some posts imply…). BTW: In case you do not like to clutter your source with all these addition parameters in your attributes, Phil uses the MVC infrastructure to resolve and inject localized messages using a convention based approach. The reason this does not work is that this message does not come from validation, but from binding. Binding is what turns the text into the appropriate data type (which implies „syntactic correctness“), while semantic validation checks the resulting value against some rules. See here for background. Define a resource file in App_GlobalResources – yes, I said, don‘t use it. This is the exception that proves the rule! Wonder why it works in that twisted way? “Aside from the standard localization of MVC, this message isn’t easily changeable (it was added at the last minute, and we didn’t offer an override unfortunately).” see here, one of Brad Wils‘ comments. Just for completeness: All this is based on the fact that MVC uses jQuery unobtrusive validation. Should you be using jQuery validation directly, you have to adjust $.validator.messages. See here for a complete example. The last part addressed larger chunks of HTML content. In that case, imperative coding works nicely. For labels, menu links and similar texts however, the standard localization mechanism in .NET is resources, based on manifest resources, and respective satellite assemblies. The reason is that ASP.NET works with code generation for views (WebForms as well as Razor), thus the generated code lives in another temporary assembly, not the one associated with the web project, and won’t have access to an internal class. Please note that this applies to the generated accessor class, not the resource itself. One can always use ResourceManager and access a resource in any other assembly. And to get another point out of the way: With ASP.NET WebForms you might have used the special folders App_GlobalResources and App_LocalResources to place your .resx files in. Don‘t do that with ASP.NET MVC! The problem is that resources files in these folders are treated differently by Visual Studio and the ASP.NET runtime. There are workarounds to make it work, but why rely on quirks if another approach works without. If you are interested in the background, Scott has further information. 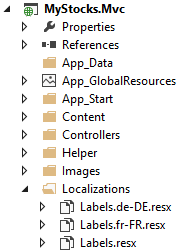 The resource file Labels.resx and its localized version Label.de-DE.resx contains all navigation labels used in menus and other links. Final hint: I can live with that approach, i.e.maintain resources in arbitrary files, that I organize as I like. Should you want to “attach” resources to you views and have them used automatically, you might want to have a look at Matt’s post. It should also be possible to implement a simple fallback scheme that allows keeping general labels automatically in one centralized resource file, while maintaining specific labels in view specific resource files. … which uses the _Index_featured_en-US.cshtml and _Index_featured_de-DE.cshtml partial views respectively. Careful, though. There is no fallback in this code, meaning you have to provide all localized versions, which may not always be necessary or feasible. However, it‘s quite easy to come up with a helper method, that looks for the respective files and implements proper fallback strategies. I do not need to walk you through respective solutions however, as Vlad has already written about the topic. He adds region specific view folders and evaluates them using his own view engine (for WebForms, but the principle holds for Razor as well). You could of course apply a different naming scheme, e.g. attach the region to the view name itself. We have our user‘s language choice acknowledged and can start making use of it. Let‘s start with a topic that is not exactly MVC (which is probably why so many tutorials don‘t mention it), but I would like to get it out of our way: region specific information in CSS style sheets. That much s independent of the region. UICulture is readily available from the view class. Putting the language in the lang and the xml:lang attribute (provided you maintain XML conformity) – and omitting it anywhere else, like in the http-equiv header Content-Language – is the recommended way of providing this information. That‘s it. Simple and easy. Suppose the current culture is „de-DE“ (and and advertised on the lang attribute on the HTML element), and the application has some „information area“ for arbitrary content. If that particular content is only available in English, you might want to set the lang attribute of the respective DIV to „en-US“, perhaps to show some flag as background. The lang attribute set for the element itself. The closest parent element that has the lang attribute set (i.e., the lang attribute is inherited). In other words; The language is determined by looking for the lang attribute in the parent elements until found. This would imply that the language of a node and its subnodes changes with a lang attribute. 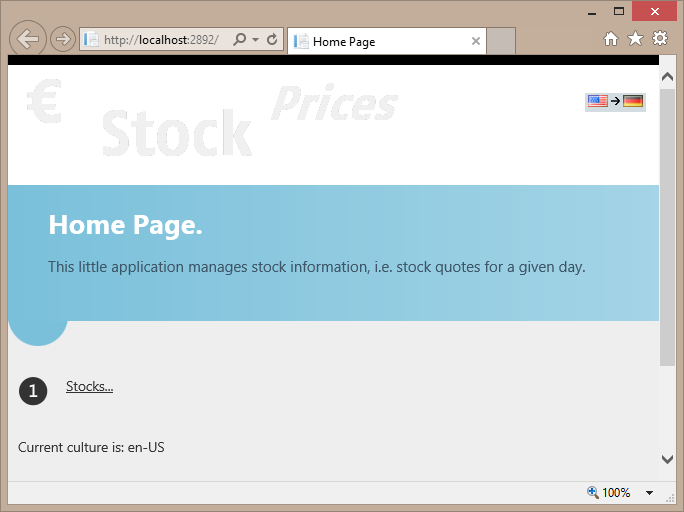 What actually happens, however – in IE and Firefox anyway – is that the language does not change, but is added. 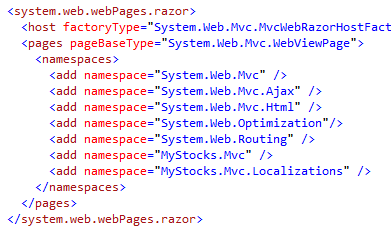 Both language tags, the one on the DIV and the one on the HTML element are “active”. And also CSS styles for both languages that use the pseudo-class. So the little image you wanted to indicate the language is determined by the precedence of the language dependent styles – not the language itself. Granted, it’s rarely an issue. But if it is it can be very annoying! The last post showed how we could honor the language preferences the user declared in his browser. However, it is also good practice to let the user change the region, independent of the browser settings. As we know, each request comes with the accept-language header, telling us language preferences set in the browser. We need something similar to maintain the overriding culture choice. One option, that is used very often used, is including the region in the URL. This implies addressing the culture in every route declaration, and every action link needs to provide the culture as additional parameter. Alex shows how the URLs can be analyzed and the culture applied using a custom MvcRouteHandler; Nadeem does it in a Controller base class with similar intentions. Something in the same line should be possible for generating URLs (e.g. with a custom route class). This certainly works and there is nothing wrong with it. Still, I don’t like this approach all that much. From a technical perspective, URLs in static content like CSS files are still not addressed properly. Additionally there are also other MVC features affecting URLs as well, e.g. areas, which might cause problems. And from a more “semantic” perspective, URLs are meant to address "resources" – which is a hard enough task already. Language preferences, similarly to skin and other profile data, is kind of "orthogonal" information affecting the rendering, but not addressing the resource. Unfortunately MVC does not really give an answer on how to pass that kind of information, which is why you can find all possible approaches (URL parts, query params, cookies, user session, …), none of which is always good or always bad. For the problem at hand, the preferred culture, my choice is using a cookie: Adjusting the URL feels too invasive, query params are too error prone, and no need to enforce a session. I don’t trust the cookie to contain a valid value. Call me paranoid, but somebody could have tampered with the request. If you want to cater to the user’s language and region choice, the first thing to do is actually take note of his choice. This is very basic stuff and I’m only going into this detail because I have actually seen code that uses the header value as if it contains exactly one language and ignoring the weight. Accessing the header value and setting the cultures is something that can be found in every blog post and tutorial. Actually ASP.NET would do this automatically (see also Scott’s post). Unfortunately this is simply too shortsighted. I don’t want the user’s first language choice applied unconditionally. I want the user’s language choices that I can best support with my supported cultures. My application is going to support English and German. What if my French colleague showed up? We could set the culture to “fr-FR” (as, in fact, the above code will do). Since there are no French localizations, proper fallback strategy should ensure he gets English texts. Is this really the best choice, if he asks for “fr-FR,de-DE,en-US”? And what about date formats? Is the meaning of 01/06/2013 immediately obvious? Does he even suspect, that – within an otherwise English UI – this is actually the first of June (interpretation as dd/mm/yyyy) – not epiphany (mm/dd/yyyy)? Thus it is better to present him a consistent (in this case American English, i.e. en-US) version, rather than a confusing mix. So, what I want is matching the users’ list of preferred regions (all of the header values, not just the first one!) to the collection of regions my application supports, and set the culture to the best match. This is something I have rarely seen addressed, much less correctly. E.g. Nadeem is one of the few who actually recognized that necessity; still, his implementation does not quite meet my expectations. Let’s make that crystal clear: Say my application supports en-US and de-DE, with en-US the default. If the user’s request is "de-DE, en-US;q=0.8", then de-DE is the perfect match. (Obviously.) Likewise, if the user’s request is "fr-FR, en-US;q=0.8", then en-US is the perfect match. Not the users’ first choice, but anyway. Also if the user’s request is "fr-FR, de-DE;q=0.8, en-US;q=0.5", then de-DE is the perfect match. This is a case which most, if not all implementations I have seen, are missing. Something that is also missed quite often: If his request is "de, en-US;q=0.8", then de-DE is still the correct choice, because de encompasses all German regions. If his request is "de-AT, en-US;q=0.8", then en-US is the best choice, because it’s a perfect match, while de-AT matches de-DE only partly. This is debatable, but since he could control that via the browser settings, it’s better than other interpretations. If his request is "de-AT, fr-FR;q=0.8", then we have no perfect match. But de-DE matches de-AT at least partly, so it would be a better choice, than using the fallback to the default region en-US. Only if no requested region matches any of the supported cultures even slightly, e.g. "es-ES, fr-FR;q=0.8", the default region en-US is used – nothing else that could be done. Now we can start matching the user’s cultures and the supported cultures. The predicates do the actual match for a pair of cultures. For the perfect match this includes a requested neutral culture matching a region, see the second example above. UICulture is a shortcut available from the view base class. Quite a bunch of code one has to write himself for a regular demand, if you ask me. The one thing we need to be aware is that we are dealing with two different contexts: The server part, defined by the .NET Framework, and the client side, defined by HTML et al. These contexts differ in the terms they use, in their customs, and in their technical scope. In short, we are talking about "en-US", "de-DE", and so on (ignoring special cases). One distinction is made regarding neutral cultures (associated only with the first part, e.g. "en" and "de"), and specific cultures, associated with the country or region. Still, neutral cultures are still maintained in CultureInfo instances, including information beyond the language. They generally rely on the "major representative" of that language. i.e. Germany for German (sorry Austrians ;-)), and the United Kingdom of Great Britain and Northern Irland … no wait… that former colony of theirs , for English. It should be noted, that CultureInfo deals with all aspects regarding regions: It acts as language selector, provides date and time formats, even the calendar is addressed. All in all, a comprehensive and consistent system. "en-US": the U.S. version of English. "en-cockney": the Cockney version of English. "i-navajo": the Navajo language spoken by some Native Americans. And, indeed, you’ll find that most localized HTML or CSS code you may come across (in samples and documentation) uses two-letter language codes. BTW: Whenever I wrote HTML, this also included XML, CSS, and HTTP (here and here). Regarding localized content, HTML only allows denoting the language by the lang attribute. You can mix different languages in one document, but HTML itself does not do anything further. CSS selectors on the other hand can be used to attach styles depending on the language. For an LOB application, using "language" in the limited sense of HTML is far to shortsighted, thus I will use regions (respective specific cultures on the server, respective tags with language code and country or region), whenever possible. This may seem odd in HTML or CSS, but so what? And the next post will contain some code, promise.